The decals may need replacing at some point, but show normal wear and tear. The black gel coat has been waxed, clay barred, ceramic coated and compounded to maintain its shine and depth. 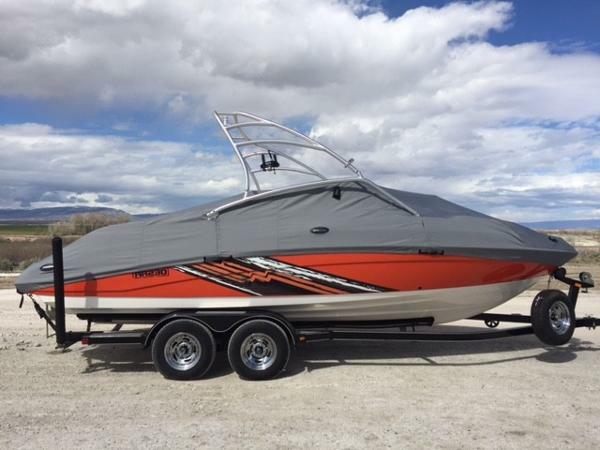 Comes with a Yamaha custom, fitted boat cover, and the Seller had custom Sunbrella side covers made to cover up the black on the sides as well. 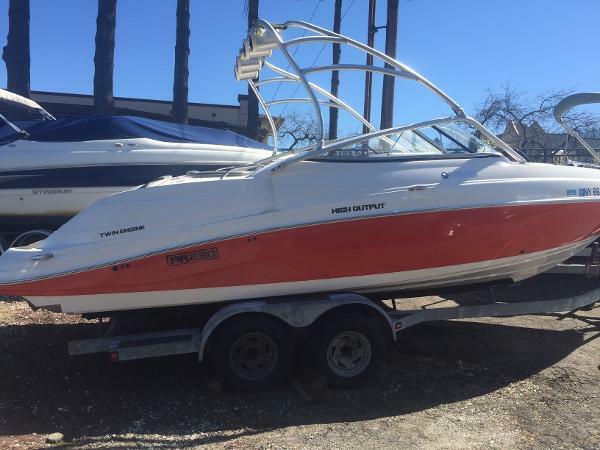 Has both an automatic and a manual bilge pump Has a panoramic rear view mirror Known issues: Horn and depth gauge work intermittently, may need servicing Stock #161139 TWIN 160HP YAMAHA JETS, ONLY 250 HOURS!!! TRAILER INCLUDED!!! READY TO PLAY!!! 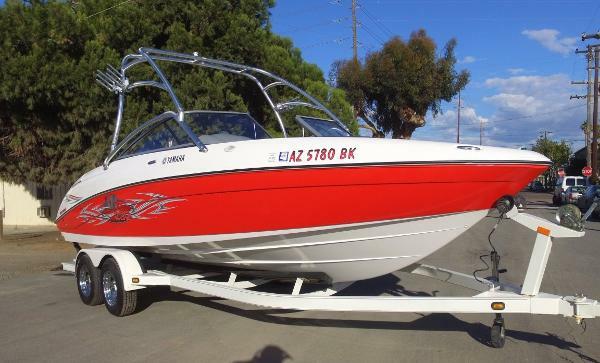 If you are in the market for a bowrider, look no further than this 2005 Yamaha AR230 HO, just reduced to $25,500 (offers encouraged). 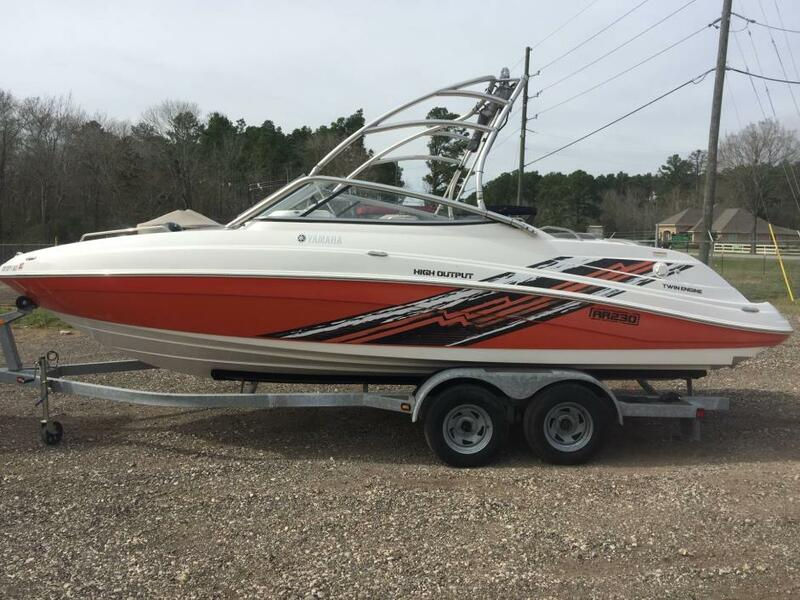 This boat is located in Bay Saint Louis, Mississippi and is in great condition. She is also equipped with twin Yamaha engines that have only 250 hours. Reason for selling is upgrading!. 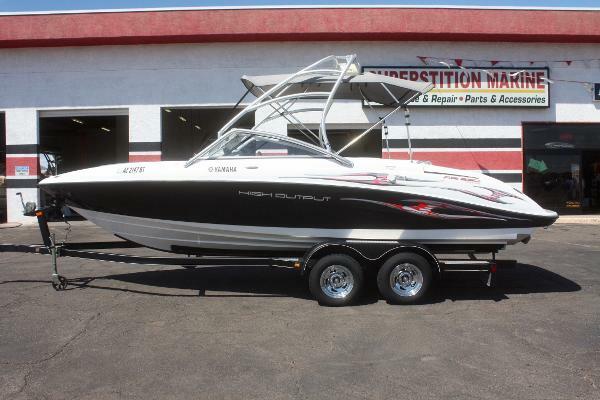 2008 Yamaha AR230 HO VERY CLEAN! 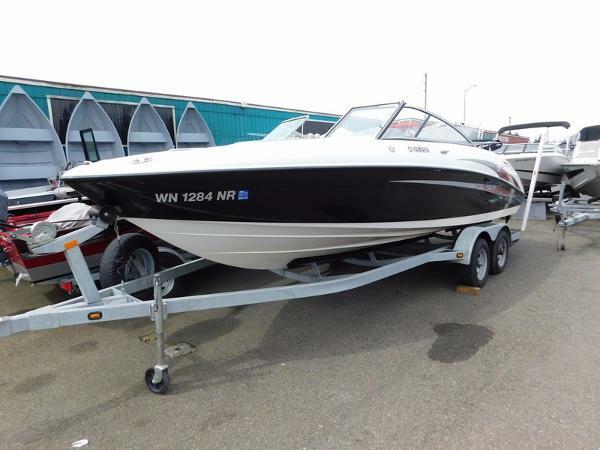 FRESHWATER USE ONLY!This gently used 2008 AR230 is powered by TWIN High Output 4-stroke engines. 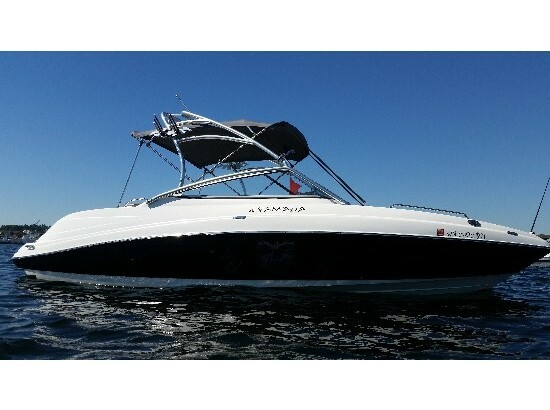 Other features include Full cover, Wakeboard tower with Bimini, Extended swim platform, NEW fish/depth finder, Sony CD sound system with transom remote, Head/storage compartment, Built-in cooler, Large ski/wake board storage, Cockpit carpet, Reclining passenger seat, Independent shifter/throttle for each engine, Anchor locker with anchor, Nice custom tandem axle trailer, Lines, Fenders and Life jackets. Complete service performed in 2016. Shown by appointment only. PRICED TO SELL! 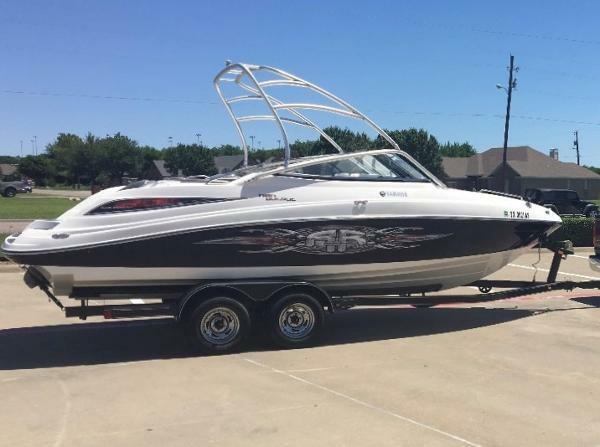 2005 Yamaha AR230 HO Designed to satisfy you whether you are behind the windshield or at the receiving end of the wakeboard rope, the AR230HO is an essential component of every family with a flair for water sports. 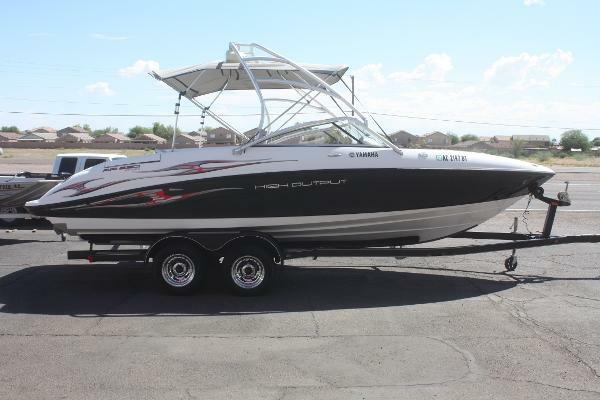 Offering Twin High Output Yamaha Marine engines, instantaneous acceleration, decisive handling and brilliant maneuverability, this 23-foot boat was designed as much for the driver as it was for wakeboarders and skiers. Fully appointed with all the amenities you would expect from a Yamaha, its aluminum wakeboard tower offers both style and function and an innovative seating layout gives everyone onboard room to breathe. And the swim platform area is always prime real estate. This boat is in excellent condition with just over 200 hours on the twin 160HP High Output MR-1 engines. It comes with snap in carpet, bimini top, front filler cushion, table with 2 posts and an upgraded 11 speaker and 2 amp stereo system and 2 marine batteries with switch. The gelcoat and graphics are in excellent shape and the upholstry is in near new condition. The snap in carpet is in good shape as well. The trailer is also in great condition. All lights, brakes and bearings have been checked and serviced. It has been inspected by the Yamaha dealer and had a full service and is in excellent running condition and ready for the water. 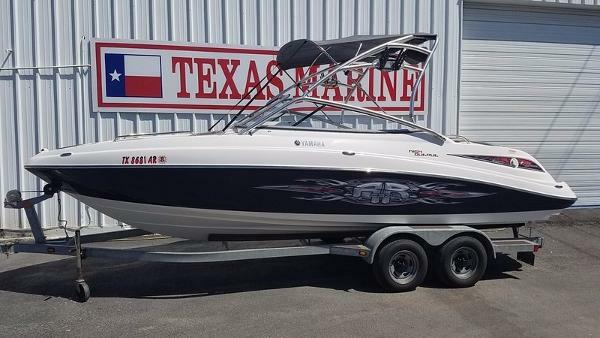 2006 Yamaha AR230 HO 2006 Yamaha AR 230 HO AR230 High Output Wake Board Boat with twin 160hp Yamaha 4 stroke jets, bimini top, boat cover, wakeboard tower with racks, tandem trailer with disc brakes and folding tongue, $21,900 at Boat Sellers, visit our warehouse, financing available, trades considered. Designed to satisfy you whether you're behind the windshield or at the receiving end of the wakeboard rope, the AR230HO is an essential component of every family with a flair for water sports. 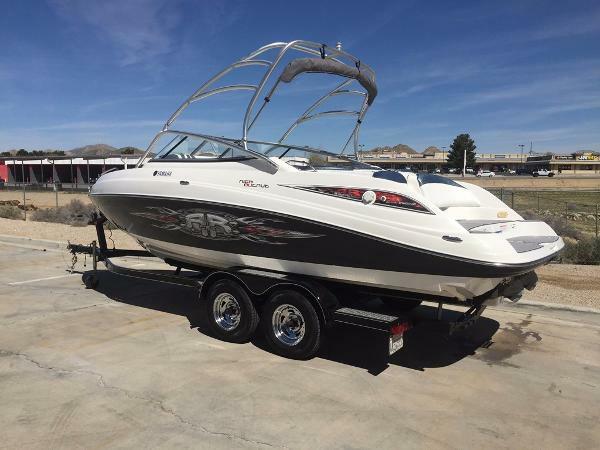 Offering Twin High Output Yamaha Marine engines, instantaneous acceleration, decisive handling and brilliant maneuverability, this 23-foot boat was designed as much for the driver as it was for wakeboarders and skiers. Fully appointed with all the amenities you would expect from a Yamaha, its aluminum wakeboard tower offers both style and function and an innovative seating layout gives everyone onboard room to breathe. And the swim platform area is always prime real estate. _______________________________________________________________________ The Boat Sellers have been serving San Diego and all of Southern California for over 18 years, buying and selling used trailerable powerboats. Our service department inspects and prepares each pre-owned boat before sale. We also offer service after the sale. We service Mercruiser, Volvo, Johnson, Evinrude and Mercury motors. We are a licensed Broker and are always looking for clean used inventory. Let us Buy or Sell your boat. We accept cars, trucks, motorcycles and boats in trade. We frequently sell and ship boats to Australia and Canada and can deliver boats to Long Beach, CA for shipping. Delivery to WA Washington, OR Oregon, UT Utah, NV Nevada, AZ Arizona, CO Colorado, TX Texas and the rest of the country can be arranged. We are only 8 miles from San Diego International Airport. We are a 1 to 2 hour drive from most of Los Angeles, Orange County, Riverside and San Bernadino. You will be glad you made the trip. _____________________________________________________________________________ We frequently stock boats from manufacturers like Sea Ray, Bayliner, Maxum, Chaparral, Larson, Tahoe, Yamaha, Sea Pro, Tracker, Ebbtide, Baja, Fountain, Formula, Boston Whaler, Rinker, Reinell, MasterCraft, Seaswirl, Four Winns, Cobalt, Crownline and Triumph. We sell mostly open bow, bowrider, center console fish boats, walk around cuddy, cabin cruiser, deck boat and bass fishing boats. If we do not have the right boat for you, let us know and we will try to find the right one for you. 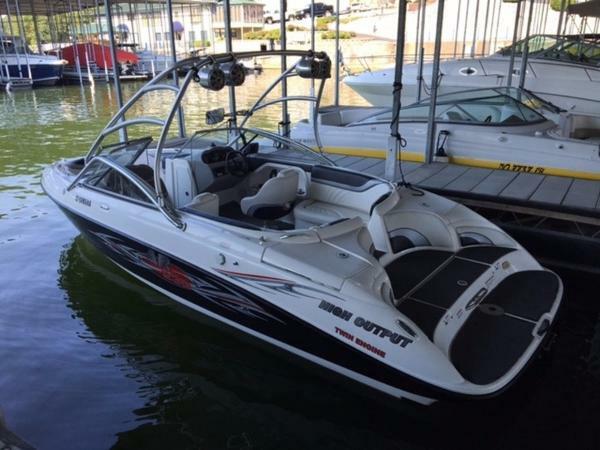 2006 Yamaha AR230 HO Designed to satisfy you whether you are behind the windshield or at the receiving end of the wakeboard rope, the AR230HO is an essential component of every family with a flair for water sports. 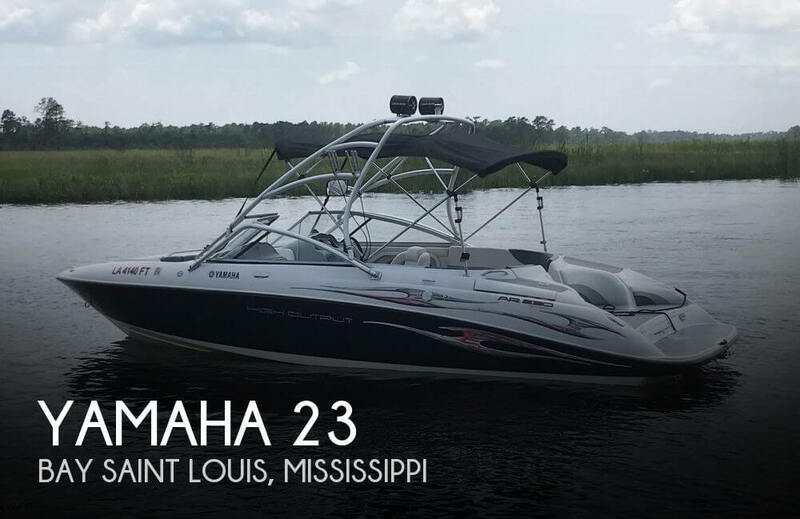 Offering Twin High Output Yamaha Marine engines, instantaneous acceleration, decisive handling and brilliant maneuverability, this 23-foot boat was designed as much for the driver as it was for wakeboarders and skiers. Fully appointed with all the amenities you would expect from a Yamaha, its aluminum wakeboard tower offers both style and function and an innovative seating layout gives everyone onboard room to breathe. And the swim platform area is always prime real estate. This boat is in excellent condition with just over 200 hours on the twin 160HP High Output MR-1 engines. It comes with snap in carpet, bimini top, front filler cushion, table with 2 posts and an upgraded 11 speaker and 2 amp stereo system and 2 marine batteries with switch. The gelcoat and graphics are in excellent shape and the upholstry is in near new condition. The snap in carpet is in good shape as well. The trailer is also in great condition. All lights, brakes and bearings have been checked and serviced. It has been inspected by the Yamaha dealer and had a full service and is in excellent running condition and ready for the water.